One of the most important first steps in setting up your new Bizzy Boutique online store will be to edit your "Site Settings" page. In order to edit your Site Settings, first log into your store admin. Once you're logged in, navigate to Administration and select Site Settings. Once there, you have several areas available for editing. Below, each section is described for you so that you can better understand the function for each. NOTE: Some areas should not be edited without first speaking with a member of our staff! As always, if you have any questions, please feel free to open a ticket. Company: Enter your company name, which will appear as a header on your site if you do not have a logo. This is also the name that will appear in the address bar, if a meta title is not defined, and the name used for the website footer copyright. Website URL: This is the URL in which your unique Bizzy Boutique license code has been assigned. DO NOT EDIT THIS AREA, or you will experience full immediate website downtime. Your services have been assigned by domain, and can not be changed without assistance from our staff. If you would like to change your domain name, please open a ticket to discuss the change with our staff. If you are ready to bring your site live, you must receive assistance from our staff- we're happy to help! Admin Email: Enter the administration email address you wish to use to be notified about site processes, inventory quantities, wholesale setup, contact form, etc. It is highly suggested that you use an @domain.com address for this field. Frequently, due to inbound server settings, if you attempt to use a free account address in this space (@yahoo.com, @gmail.com, @aol.com, etc.) these messages will be blocked before they make it to your inbox. To resolve this error, use an @domain address! For information on how to set up new email accounts, see here. Catalog Page: Your catalog page has been pre-setup for you. Editing this area without prior discussion with our staff will result in errors on the customer side of your store. Please do not edit this space from the preset "catalog.htm" DO NOT EDIT THIS AREA, or you will experience partial but immediate website downtime. Page Extension: This area has been pre-setup for you to use .htm extensions on all pages of your site. This is preferred. Please DO NOT EDIT THIS AREA, or you will experience immediate website downtime. Sm Image Dir: Your small/thumbnail image directory. Lg Image Dir: Your large image directory. Category Img Dir: Your category image directory. General Img Dir: Your general image directory. Image directories are pre-set for all clients to have all images uploaded into the same /images folder and directory. This is the suggested set up for most clients, but we recognize that there are some instances in which you may prefer for your images to load into different folders. If this is your wish for your own store builder setup, please open a ticket to discuss an alternate set up with a member of our staff. Site Message: Your site message area can be used to include a short bit of information about your store, hours of operation, current sales or specials, and so much more. Enter any information you'd like in this area. 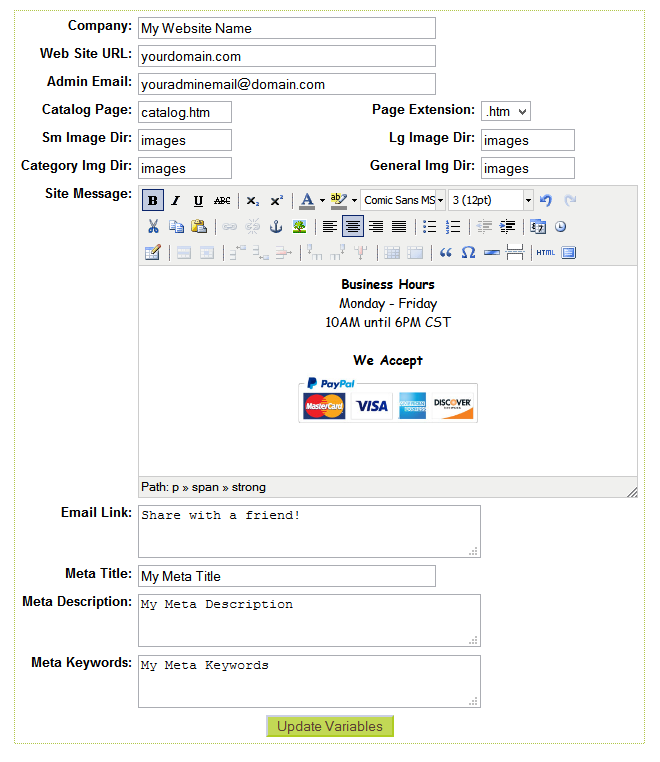 Your site message will display where it is assiged in your template. Frequently, this will be across the top of all content pages, or in your website template sidebar. This area can be moved to a different location by having your designer edit the template code HTML. Email Link: If you wish to use the email a friend pop up, enter the text you wish to display in that link. This can include any short message you'd like- in the above example, we've used "Share with a Friend!" as our email link text. When text is entered here, it will display as a link on the product page so that website visitors can send a link to this product to a friend. Your meta title/description and keyword areas are meant for SEO set up. This area is your default, primary, website-wide SEO. We've compiled a list of SEO tips and tricks, as well as advice on what to put in these areas in an article here. SEO and meta information for individal pages, cateogies and products will be set up on those individual store admin pages. When you have finished making your Site Settings, be sure to select "Update Variables" to save your changes.